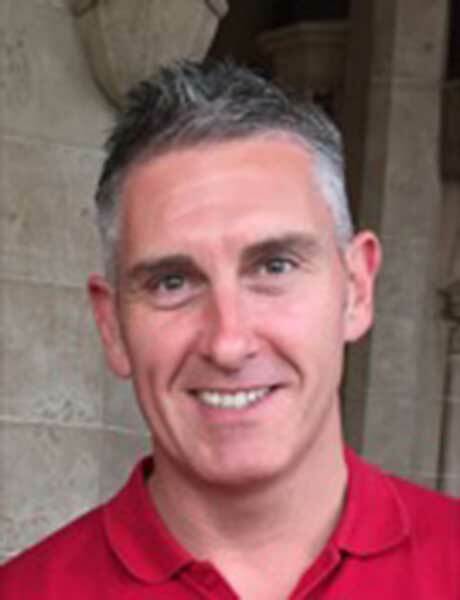 I’m Andrew, aged 46 and 1/2 and live in Edinburgh. Having previous cycled from Edinburgh to Dublin for the Scotland match in 2015, you think I would have learnt to say no to such crazy challenges. 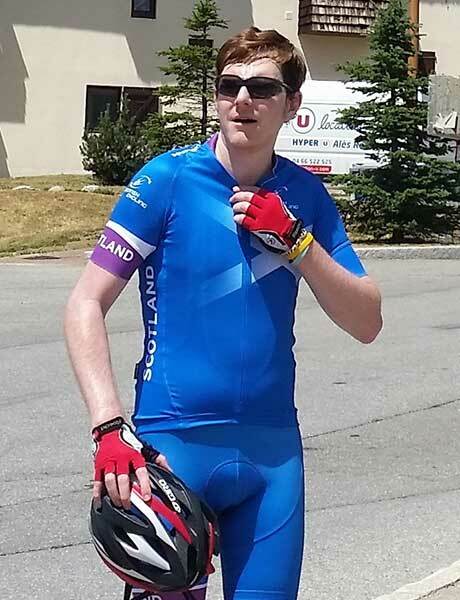 However, I found having the chance to combine my favourite pastimes of supporting Scotland and cycling whilst raising money for disadvantaged kids too hard to refuse. I always have so much fun following Scotland where ever they play so it’s nice to be able to give something back when I can. I’m looking forward to the challenge and riding as part of a team. I just hope it’s not all uphill, after all Wembley is down there and Hampden up here! I first became aware of the work that TASA do a number of years ago from friends who were involved with merchandising and organising fund raising. In the last couple of years I have attended a number of TASA donations whilst abroad and seen at first hand the joy and appreciation that the financial donations make to the benefiting organisations. The improvement that these donations can make to children’s lives is heart-warming and makes you appreciate just how good we have it in this country. When I was made aware of the idea of doing a bike ride from Wembley to Hampden to raise funds for TASA I was extremely keen to participate and offer any advice / help in organising this event. 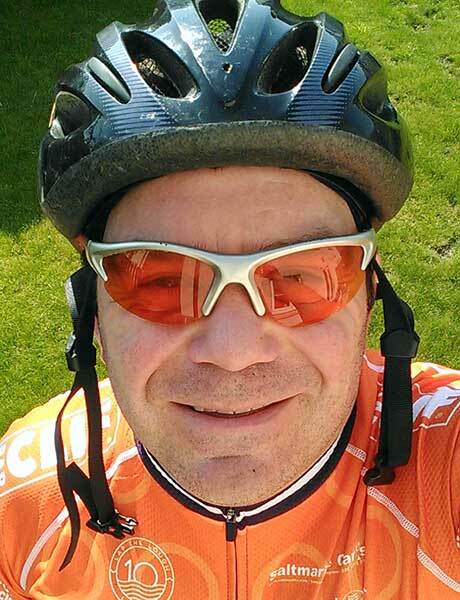 Having taken up Road Cycling 3 years ago it has become my number one sport and I find it an excellent way to keep fit, now that I’ve a self- imposed ban from playing football due to injuries. This will be a decent test of endurance over 5 days and I hope to raise as much money as possible for a worthwhile cause that shows just how generous Scots can be. 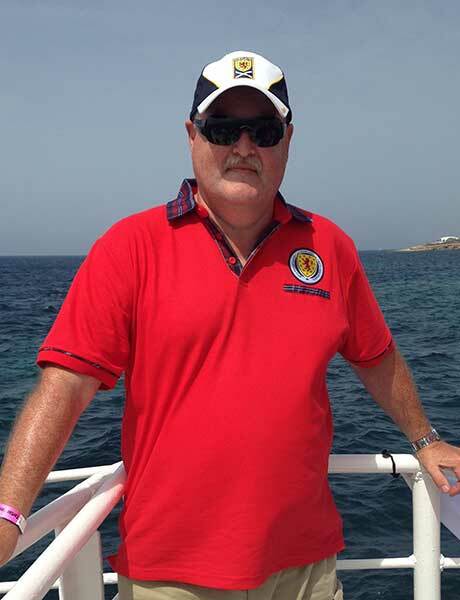 I have been involved with the Tartan Army Sunshine Appeal for around 4 years after being invited along to a presentation to a children’s charity in Serbia in March 2013. I was overwhelmed by the generosity of what was essentially football supporters donating money to charity in a country where the Scottish national team were playing. I have now attended several such presentations in a number of different countries, and have recently been invited onto the steering group, the body of volunteers who work tirelessly behind the scenes raising the funds required to ensure the continuation of such donations in the years ahead. 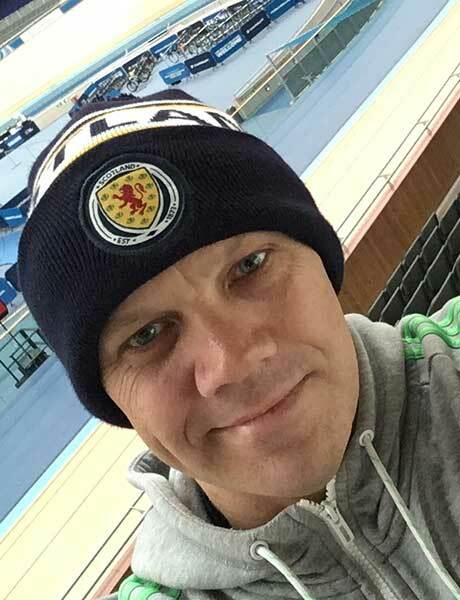 Sometime around September 2016 during a conversation with Tom Dearie and Stephen Thompson the possibility of raising money for TASA by organising a bike ride from Hampden Park in Glasgow to Wembley stadium, London, for the England v Scotland world cup qualifier on 11 November 2016 was discussed. It was decided that it was too late to organise such a ride in the short period of time there was till the game, however with the return fixture being on 10 June 2017 in Glasgow, there was plenty of time to arrange a ride from Wembley to Hampden. The idea has now become a reality and along with a group of good friends around 10 of us will embark on this endeavour on 6 June cycling some 450 miles before arriving at Hampden Park on 11 June shortly before kickoff. I would consider myself a recreational cyclist, and have completed a few 50-100 mile rides. 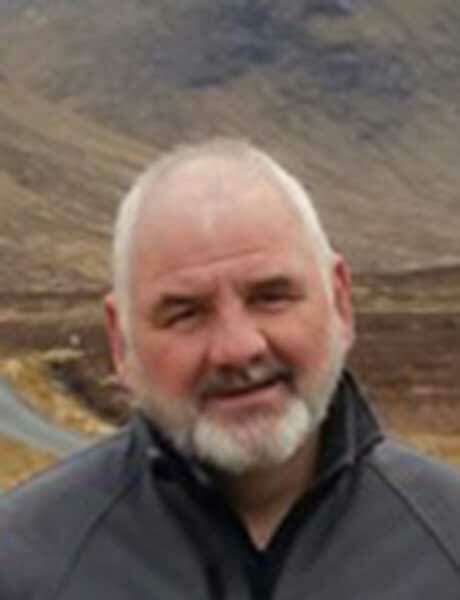 This project will require the full application of mind, body and determination to ensure its completion and should I need any kind of motivation my thoughts will be of the previous donations I have attended, and the knowledge that all monies raised by us will assist with the continuation of such donations in the countries visited by the Scottish national football team. 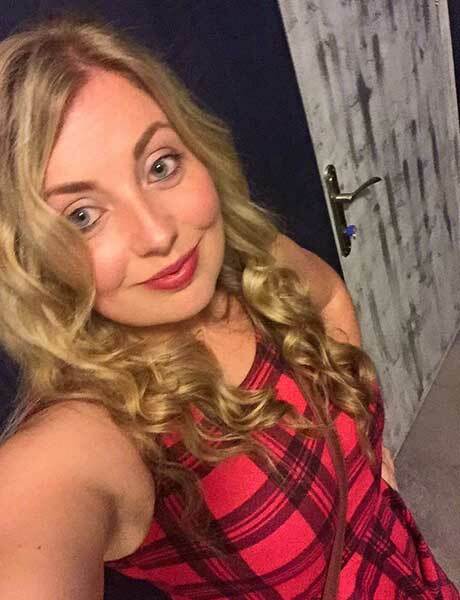 27, I work as a Senior Pharmacy Technician for NHS Scotland in a medical receiving unit. I have been lucky (or unlucky) enough to have been travelling to Scotland away games since I was just 19 years old and that's how I became aware of TASA. I've wanted to do some sort of physical challenge for TASA for a while and when Tom suggested this challenge, I thought "perfect! Where do I sign up?" Working in the NHS for the last 9 years has taught me that life is all too short and we should make the most of the time we have and experience as much as we can. It's also nice to give something back. I hope to complete the challenge for my own sense of achievement and to raise as much money as possible for TASA. I've been to a few donations over the years and they have brightened the lives of so many children that I'd like to help them continue this. I'm also the only girl taking part in the cycle so I also hope that I can be an example for others - we can achieve anything we want if we set our minds to it. 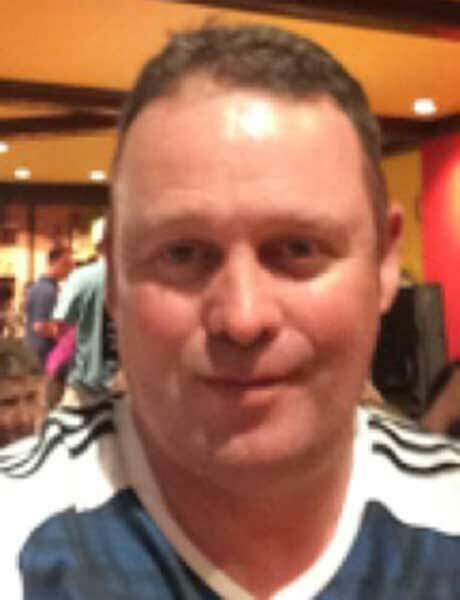 My name is Jock dearie I am 47ish years old and the proud father of 4 Jennifer, Craig Casey & Tegan, & happily married to Denise. I was asked ages ago by a member of the steering group (TASA) if I would be interested in doing a charity bike ride. I enthusiastically agreed, Did not hear anything for a while then came the ominous message that it was on, Tom informed me that we would be doing Wembley to Hampden arriving at Hampden on the day of the game! I started training for this in December using the turbo trainer which I will continue to use till start of march before I switch to the mountain bike & start cycling to work a round trip of 48 miles a day, the plan is to do this 3 days a week with a long run of 50-60 miles at the weekend on the racer (old guy it was a racer when I was a boy so it’s still a racer). The idea behind this bike ride came about in Malta last September at the Tartan Army Sunshine Appeal presentation. Knowing how many donations had been made in 2016 alone (and after a few beers) I spoke to a couple of pals about doing something to raise money to go towards future TASA donations, namely Lithuania & Slovenia and so the Wembley to Hampden charity bike ride came about. I’ve done a few charity rides in the past and know from experience the amazing feeling of achievement that’s felt at the end of what are always tough events to complete and the knowledge that we have, in some small way, helped the charity & the incredible work they do. For ordinary football fans, through the Tartan Army Sunshine Appeal, to be able to make a donation in every country the Scotland national team play is an incredible thing to do and the thought, that in some small way, we can contribute towards helping children abroad will push the whole team on to successfully complete the bike ride. So, why I'm doing the ride? It's a combination of things I really enjoy: cycling and daft challenges. The fact that it will benefit others just makes it all the sweeter. It will also come in handy as training for my week in the Alps this July. Although I'm not sure how I'll get on cycling on the 'right' side of the road. Whilst in Malta for the Scotland World Cup qualifier we got chatting to Tom about the possibility of a Wembley/Hamden bike ride for TASA. Although I'm perfectly competent on a gym-bike, I'd be a liability on the open road; so volunteered to help as part of the support team. I attend the charity presentations at away games and see how overwhelmed they are by the generosity of the Scotland supporters. Many of these little kids have nothing and are terminally ill, but they are so happy and grateful; it's truly humbling. Little donations can help big things happen. 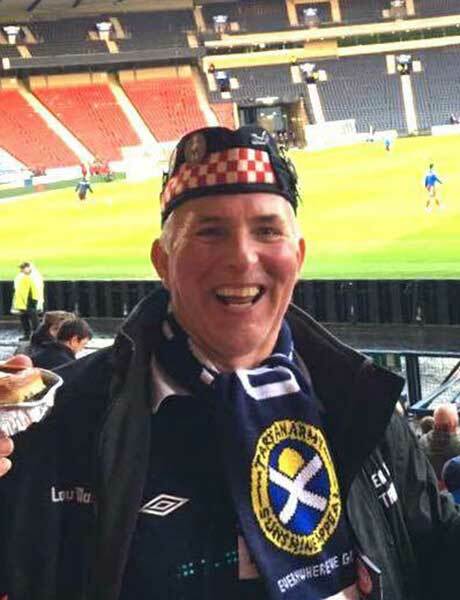 I have been a member of the Tartan Army for a number of years and attend all home and away fixtures. Being a member of the Westa Tartan army I have had occasions to hear about the good work that TASA do. I had occasion to attend one of their presentation nights in Dublin and was totally overwhelmed by the generosity of the charity and the delight of the recipients. I have since been to others in Malta . The fact that this is all being done by football fans for people less fortunate than them is great. I heard of the TASA Bike Ride at a Westa meeting and thought it was a great idea cycling from Wembley to Hampden Park . I thought that the fact that I'm not a cyclist I could not get involved until I heard you required drivers and support team. So I volunteered my services as a driver and support member which I'm delighted to be involved in. My name is Danny Letford, often known for some reason as the Rocket. I am probably the oldest member of our team having recently celebrated my 65th birthday. I have always been interested in raising awareness and funds for various charities. 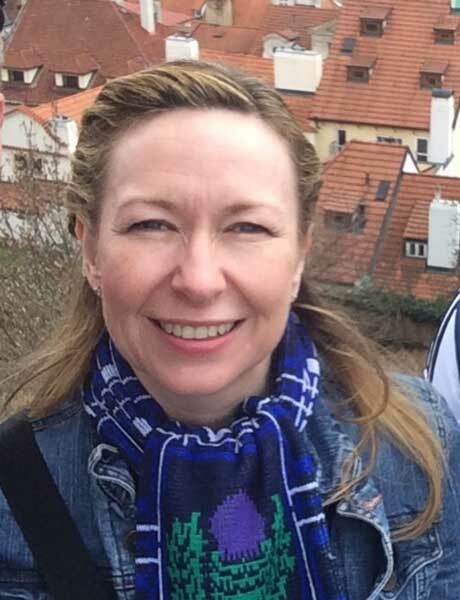 Since my strokes a couple of years ago, I have been unable to work and have focused my time on planning and taking part in many activities which help in the main vulnerable and unwell children I am a Tartan Army member and have supported Scotland both home and away for more years than I can remember. What I do remember though is the TASA visit to the Pink Crocodile children’s school in Prague on 23rd March last year It was such an emotional day which has stuck with me and the wonderful youngsters singing in thanks of the TASA support is a treasured memory I came across an enquiry from Tom Dearie asking if anyone would consider cycling from Wembley to Hampden to coincide with Scotland playing England, WELL I obviously had not taken my medication that day and volunteered immediately. As stated previously I’m celebrating my 65th year and I am Running Walking and jumping out a plane as part of my fundraising this year HOWEVER CYCLING?? I’ve only cycled to the shops and back 450mtrs not 450 miles but the auld Rocket is relishing the challenge. I am sure the most generous Tartan Army will dig deep as always and support us as we make our way home.